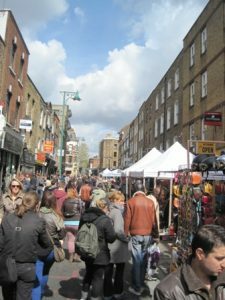 Brick Lane Market is a sprawling and lively market in East London where you can find stalls selling just about anything from empty sacks ‘useful as a blank canvas for the artist’ to what might well be rare antiques. The market is open from 9:00am to 5:00pm Sundays. The market has been trendy for a great number of years for no obvious reason. When you arrive you have no idea what you might find and that is part of the charm of the place, as is the usual East End friendliness. New and exotic fashions are tried out on the streets on a regular basis during the market.